The island that would eventually become known as Mamajuda appeared in this 1796 French map of the Detroit River, where it was listed as “Jones” Island. The title “island” is actually somewhat aggrandizing, as throughout modern history virtually all of its 25 acres have been located beneath the surface of the river with only varying amounts of low-lying wetlands protruding visibly above the surface. The island eventually became known as Mammy Judy after an Indian woman by the same name who regularly camped on the island during the fishing season prior to 1807. Because the shallow island was located smack in the middle of the main shipping channel between Grosse Isle and Fighting Island, the Mammy Judy lighthouse was established on the southeast side of the island in 1849. Erected atop a grid-work of vertical piles driven into the river bed, the station was outfitted with 4 Lewis patent lamps with 14” diameter reflectors in a birdcage style lantern 35 feet above the water. This photograph shows the Mammy Judy lighthouse as it appeared circa 1852. The cropped section of an 1876 chart of the Detroit River below shows the location of the Mammy Judy light station and graphically shows the danger largely submerged island would have represented to mariners making their way along the river, and the reason it was considered necessary to establish a lighthouse to mark the island's position in 1849. With the exception of upgrading the Lewis lamps to a Sixth Order Fresnel lens in 1855, little maintenance appears to heave been undertaken at Mamajuda, and after only fifteen years it was evident that the pilings on which the lighthouse was erected were rotting badly and the lighthouse itself had deteriorated to the point that it was considered barely inhabitable. As such, the old lighthouse and foundation were demolished in 1866 and the new structure shown here erected to replace it. If the 1866 Mamajuda lighthouse appears familiar, it could well be because it was built as a twin to the Mission Point lighthouse which was established at the north end of the Mission Peninsula north of Traverse City four years later. This photo shows the Mission Point lighthouse as it appeared circa 1880. 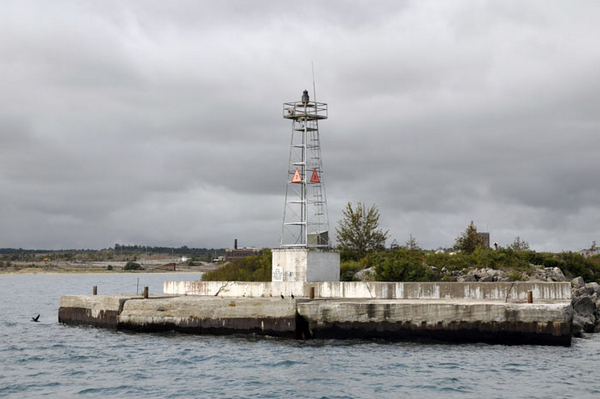 In order to better mark the down-bound channel from Grassy Island to Mamajuda, in 1892 the Lighthouse Board requested a Congressional appropriation of $1,500 to erect a front range light upstream of the island to range with the existing Mamajuda lighthouse. Congress approved the expenditure the following year, and the new timber structure in the river was completed and ready for lighting on July 16, 1894. This 1902 photo shows this structure and the elevated walkway which provided access for the keeper from his dwelling beneath the rear light. As a result of constant erosion from the wake of passing vessels, between 1900 and 1904 a number of changes were undertaken to improve the conditions on Mamajuda. Thousands of tons of rip-rap stone were transported to the island to elevate it further above the water. The old rear range lighthouse was transported across the river to serve as a dwelling for the keeper of the Grosse Isle light and a new rear range structure with a circular tower was erected on the improved ground on Mamajuda. This postcard from 1909 shows the structure as it was rebuilt in 1904 and gives a good sense of the improved living conditions which resulted. 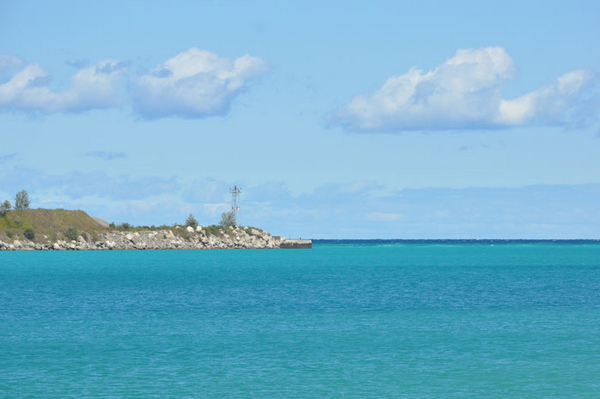 Over the years, the Detroit River was continually dredged to make a safe channel for increasingly larger vessels, and Mamajuda island became washed away, largely as a result of erosion by the bow waves of these huge vessels. Today, Mamajuda Island is largely covered by water, with only small portions of the island appearing above the water's surface during periods of lower water, and the resulting shoal area is now marked by the Mamajuda Shoal buoy. This crop from Google Earth shows that Mamajuda Island is now virtually submerged. However, the pilings which supported the old lighthouse can readily be seen beneath the water. 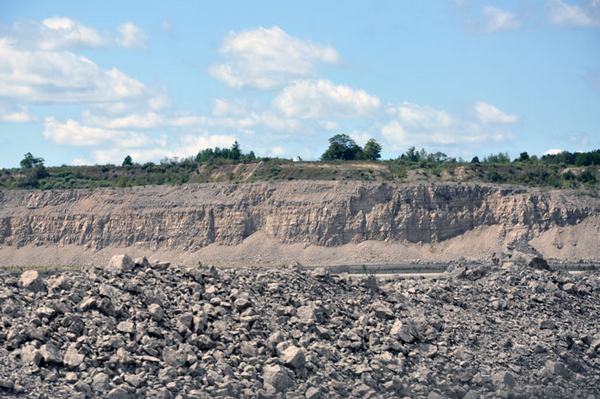 The Calcite Quarry in Rogers City is the largest in the world. 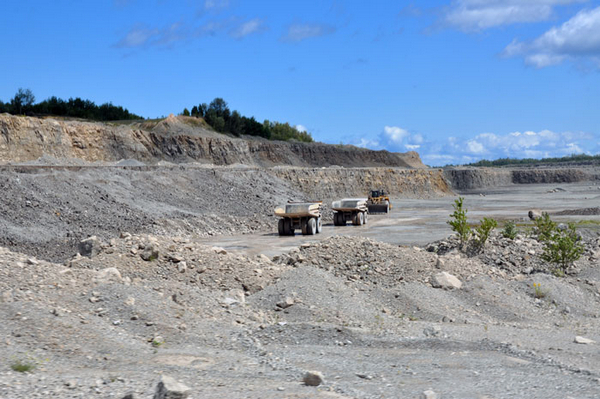 This year, the quarry is celebrating its 100th-year of continuous operation and has shipped 880,943,995 tons of stone since it opened in 2012. On Friday August 19, I was fortunate to be able to participate in a tour of the facility offered by Carmeuse, the current owners of the facility. Here are some of the photos a took during the tour - and fear not - there is a historic aid to navigation involved! 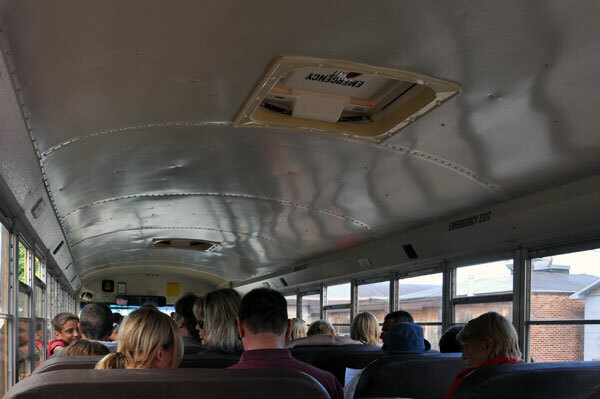 We boarded school buses at the Great Lakes Lore museum in Rogers City for the short drive to the south end of town, through the security gates and down to the working face of the quarry. 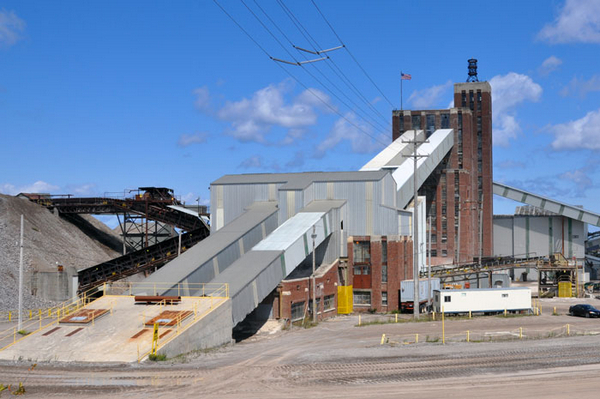 It is always possible to view the quarry from the viewing station on the quarry rim which is the white structure in the photo above, however, public tours of the plant are limited to one day a year. 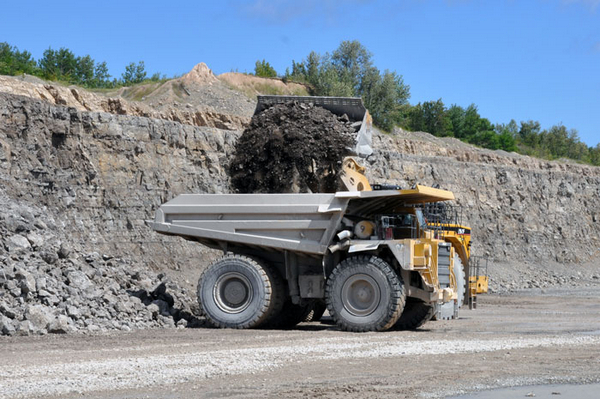 The limestone is loosened by drilling and inserting explosive charges, and is then scooped up by a loader and dumped into trucks for transport out of the quarry for further processing. Here two trucks await their turn with the loader at the current working face. 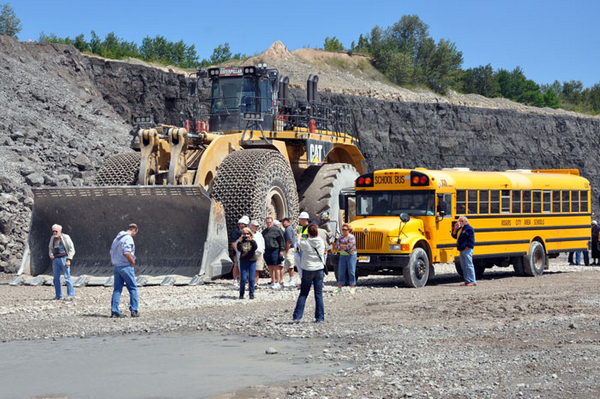 Our school bus gives a good idea of the massive size of the Caterpillar G994F loader. This loader was purchased new in 2007 at a cost of 3.25 million dollars. They have a 16 cylinder engine which outputs 1,577 horsepower and consumes approximately 43 gallons of diesel fuel an hour. The tires on the 994F loader are 13 feet in diameter and cost $54,000 each. The front tires are outfitted with chains to protect them from rock cuts. The chains themselves cost $72,000 per set - this is expensive equipment! 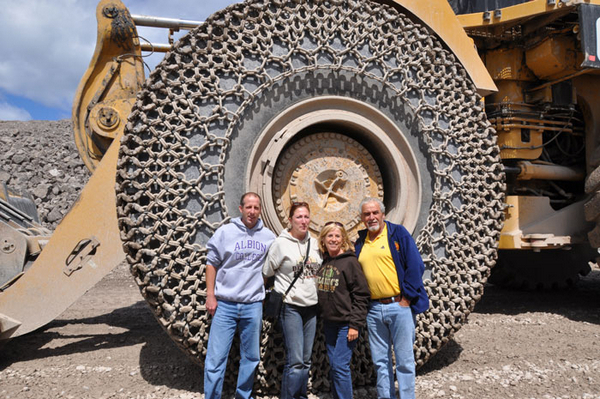 These tour participants standing beside one of the tires gives a good sens of just how large a 13 foot diameter tire is! The bucket has a 25 cubic yard capacity and holds approximately 33 tons of stone. 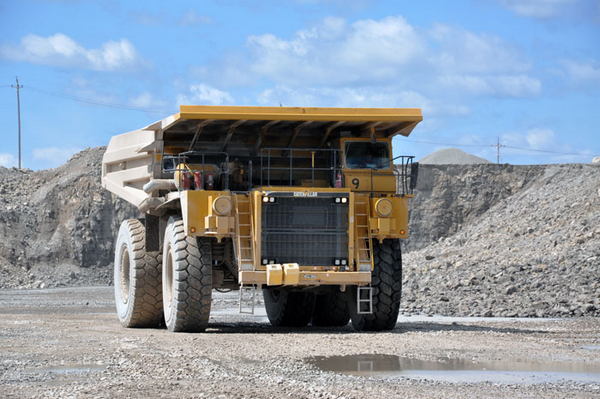 It takes seven passes to fill one of the quarry's huge Cat 789B trucks. 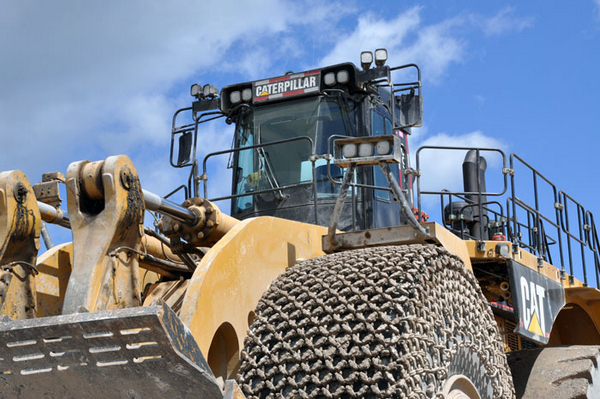 A Cat 789B makes its way toward the loader. 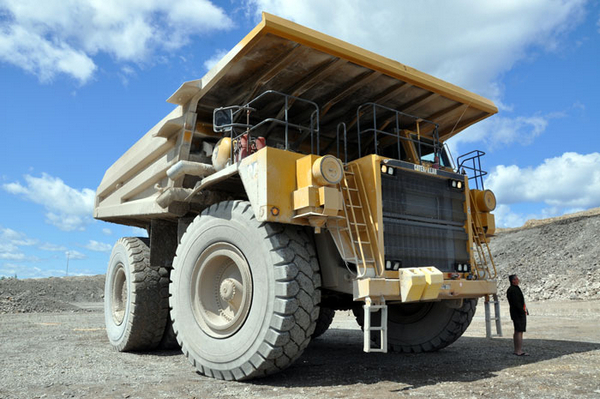 These trucks hold have 1,771 horsepower V-16 engine, with a capacity of 195 tons of stone, carry 851 gallons of diesel fuel and run at a top sped of 35 miles per hour whether empty of full. At a cost of $2.5 million dollars a piece, even the truck's tires have a price tag of $19,000 each. 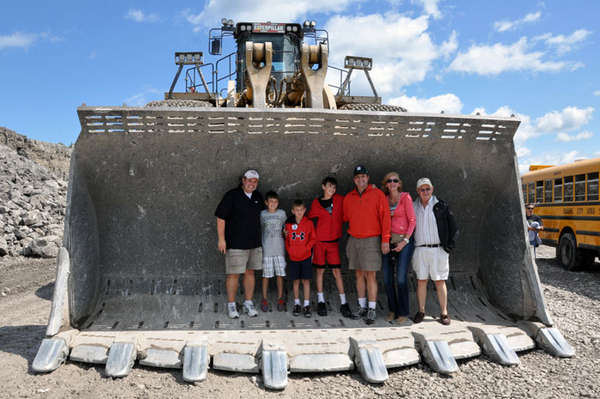 The Cat 789B pulled up in front of us, shut off its engine and the driver descended from his cab so we could get a close up view of the monster vehicle. 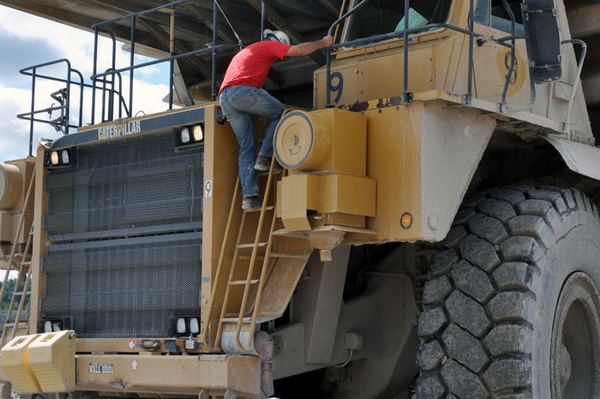 The Cat 789B stands 26 feet 9 inches high and 25 feet wide. The size of this man standing at the front bumper gives a good idea of the size of these massive vehicles. After making their way out of the quarry, the loaded trucks buck up tho this building which houses the primary crusher. 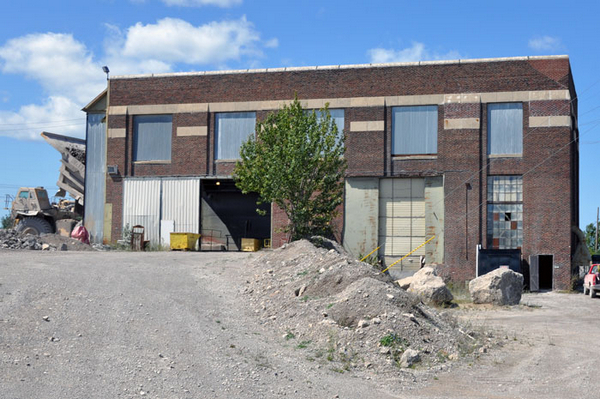 This building was erected in 1921 and contains 2 60-inch crushers which take the large stone and break it into pieces approximately 5" in diameter. Here is the view inside the primary crusher building. The truck has backed into the dump area where it lifts its bed and disgorges its 195 ton load into the first crusher. 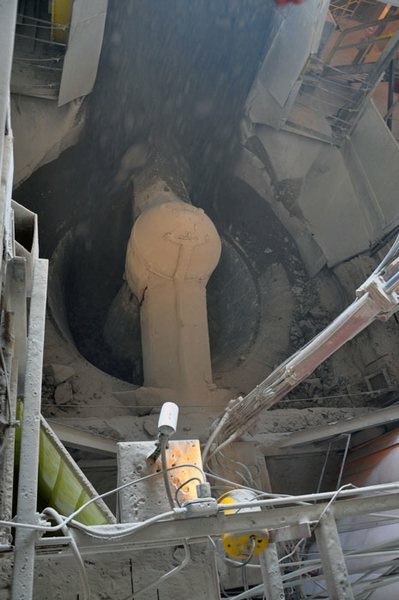 The stone is them lifted by chain conveyor into the second crusher where it is crushed to yet smaller diameter. Here is the view down into the second crusher - watch your step! 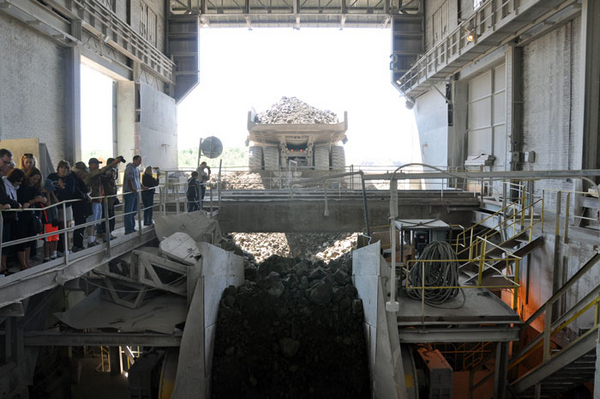 After passing down through the crusher, the stone falls onto a conveyor below the building where it is transported to the top of the Screen House. Here we see the tall Screen House and the two conveyors which come from beneath the primary crusher. Largest diameter stone is separated in the intermediate gray separating building and conveyed out by the conveyors to the left. Smaller stones continue up the conveyors into the Screen House where they pass from floor to floor falling though progressively smaller screens. They are then moved by a series of conveyors, augurs and chutes to storage piles for eventual shipment. 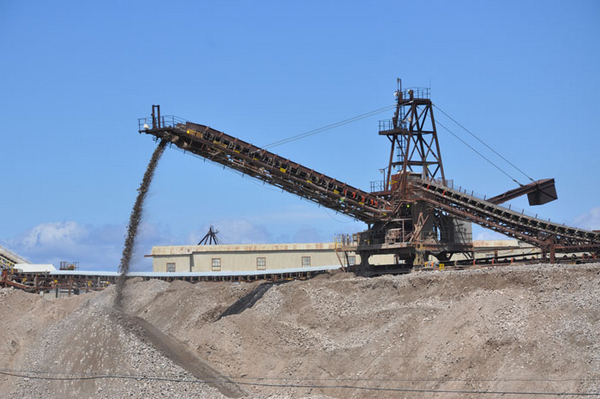 Here we see a conveyor, discharge augur and chute depositing larger diameter stone in a large pile to the left of the Screen House. 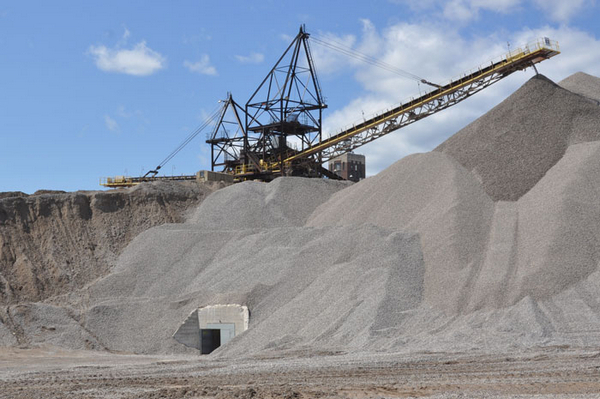 We observed that it takes approximately one minute from the time the stone is dumped in the primary crusher to pass through the initial sorting screen and onto this pile. Another conveyor, discharge augur and chute deposits a finer grade of stone on a pile on the opposite side of the Screen House. 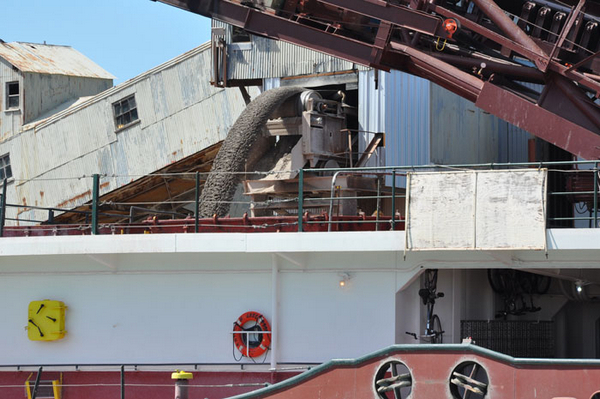 The concrete retaining wall and door serve as the service entrance to the conveyors which are located beneath the pile and carry the stone out to the dock to vessels waiting to transport the material. Here we see one of the conveyor tubes onto which the stone is piled. Openings along the top of the tube allow the stone to fall through into the conveyor to an augur at the end which carries the material to the hoppers for loading into vessels. We were fortunate that not only was there a vessel taking on stone in the harbor when we were there, but that it was the ARTHUR M ANDERSON - the last vessel to communicate with the EDMUND FITZGERALD and one of the first vessels to head back into Lake Superior to search for potential survivors. Here we see stone being loaded into the holds of the ANDERSON. The conveyor from which the stone is pouring can be moved in and out to distribute the load equally within the vessel's holds. Good communication between the deck boss and the conveyor operator are critical to ensure that this operation is conducted both efficiently and safely. 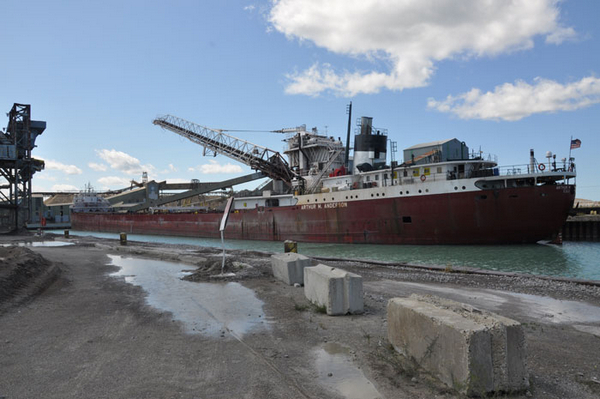 Once loaded, the ANDERSON will head out past the breakwater into the azure waters of Lake Huron and make her way downbound for Buffalo where she is scheduled to unload. There's our aid to navigation on the end of the breakwater! 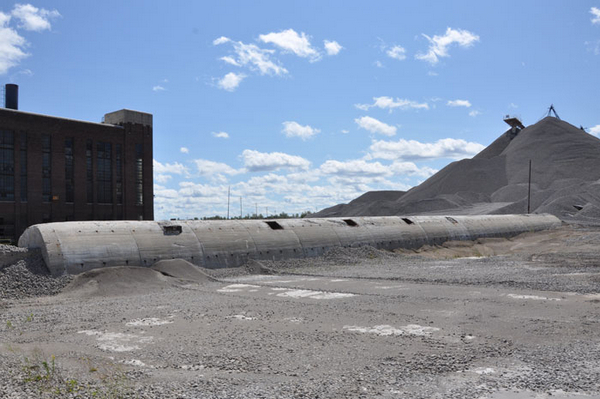 If you would like to take a similar tour of the Calcite Quarry, be sure to keep an eye on the Great Lakes Lore Maritime Museum's website over the next year. Tours are offered once a year around the middle of August ever year. Here's a link the the museum's website. Just keep checking the "Events" link.